Howard Greenberg Gallery is pleased to announce an exhibition of still life photographs by British born Charles Jones. 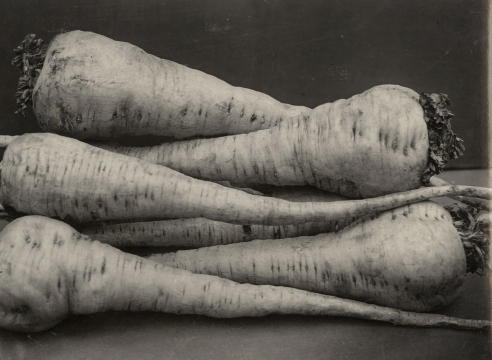 Viewed as a proto-Modernist and outsider artist, Jones, a humble English gardener and photographer working at the turn of the 20th century, is one of art’s most mysterious and recent discoveries. Jones’ work came to light in 1981, when discovered in a trunk at an antiques market in London. The only clue to the identity of the photographer were the initials “C.J.” or sometimes the signature “Charles Jones” that was scrawled on the backs of the prints along with fastidious notations giving the precise name of each of the subjects. But the story of the photographer remained unknown until a woman, seeing the photographs on BBC television, identified them as the work of her grandfather, a gardener who worked at several private estates between the years 1894 and 1910.